The End Times is a hot topic. The news with updates on different wars, environmental issues, health scares and violence increasing, it’s no wonder society may think the end of the world is near. Pastor Matt Hagee explains why from the Bible he believes we are the last generation to witness Jesus coming back. His guide gives over the reasons why and how the first 3 chapters of the book of Revelation explain the signs of how we are in the last days. He believes that believers will be taken up to heaven before the Antichrist steps on the world stage, hence why he didn’t go past chapter 3 of Revelation. This book I think is geared towards Christians, but he does speak to unbelievers. Depending on your church background or lack of church and Bible exposure you may understand what’s expressed in this book. I am a post tribulation ‘fan’. Honestly I don’t see why believers of today should get out of having to go through the tribulation. It seems like too, easy of a ticket. Some of his view points I get, but to state this is the truth vs showing the other viewpoints feels a tad arrogant. I know Pastor Hagee means well, but to me only Jesus can open your eyes to the truth. 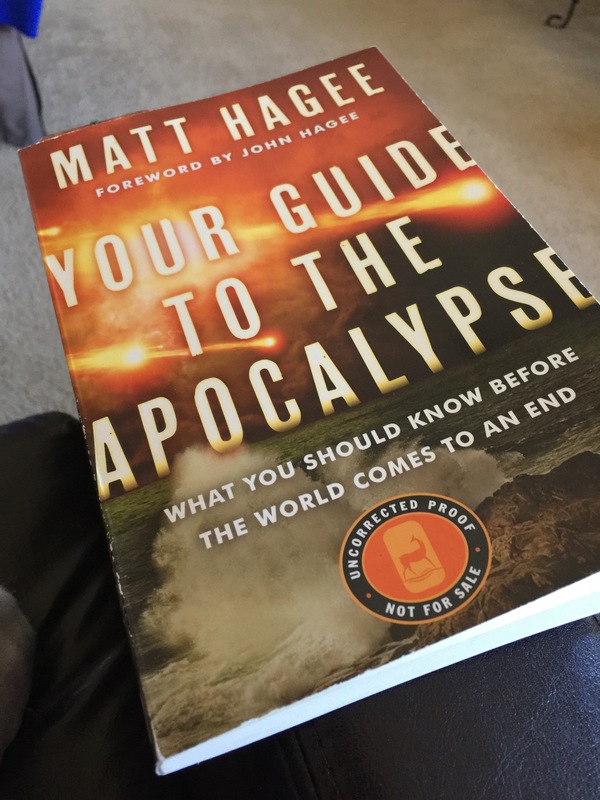 I received an ARC of Your Guide To The Apocalypse by Matt Hagee for free from Blogging For Books in exchange for my honest review. If you are a pretribulation believer then this book is for you. If you aren’t it might ruffle your feathers, or it might enlighten you.